the eric update – day 878: ’tis the season for eggnog and employment. as time goes by, it’s almost easy to diminish the mountains of gumption required to drop everything and move to rural wisconsin based in part on a crazy dream and a strong feeling that no matter how insane it seemed that somehow, someway things would work out. beyond the worries of whether or not we’d actually end up liking life in a small town ( we absolutely, positively do ) after years of living in the bright lights of the big city, there was the rather large problem of how to scratch out a living in one of the poorest counties in wisconsin. so it was quite a relief and a surprise to quickly pick up contract work at organic valley and an even bigger surprise to find that i didn’t like working for the company. i love it. it’s always dangerous to drink the kool-aid, but drink i have. it’s an absolute joy to go to work for a company with a cooperative spirit so infused into its dna. as an added bonus, the little cooperative that started with 7 farmers 20 years ago is now poised to hit $500M in sales in the near on record setting growth. and they are apparently quite appreciative when someone with my rather eclectic mix of systems implementation, process improvement, software development and analytical skills moves in their back yard. i’m very happy to announce that i’ve accepted a full time position as a demand analyst and am very much looking forward to the challenge of helping them do the things they need to do to more efficiently meet the almost insatiable demand for organic products in the years to come. next year i might have to take the odin factor into account for production planning. 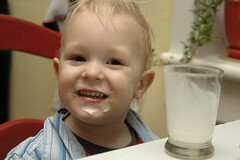 these days, when i walk in the door after a day at work, i’m greeted with "more eggnog, poppi!" Previous Postthe eric update – day 872: ahhh, the simple pleasure of a hand-operated, positive displacement, vacuum water pump.Next Postthe eric update – day 881: one of those nights when it seems impossible that he’ll be asleep in an hour. So can I hit you up next year when we need more eggnog? I’m just glad that it’s not available year-round or else we’d never drink anything else. It definitely is the best that we’ve tried so far. Horizon is a distant second, TJs sells another cheap brand (Rockwell?) which is better than nothing, and then there is Strauss, which is probably closer to traditional, but nothing I like to drink at all, as much as I like to support local. Glad to hear that OV is as cool to work for as they seem. One of these days I hope to be able to land a position like that with a company that I really admire and respect (not that I’m complaining about flickr, mind you! ).